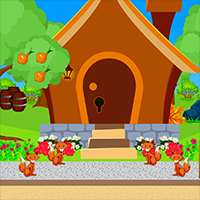 AVM Romantic Forest Escape is another point & click escape game developed by AVMGames. Today marks your 1st wedding anniversary and you want to give your partner the perfect date. You really want to prepare something romantic and you think that the Garden is the place to be. So, you came to the Garden near the block and visualized what you want to happen. Things are so cheesy but you know that your partner will love it. You want to prepare an intimate dinner at the Garden with candle lights all over the place. In addition to that, you also want to make the water fountain work during your date. This is the best idea that you ever think of so far. However, you need the manager of this garden to help you set up the place. But while you were walking through the garden, you noticed that you were trapped in a maze. Good Luck and have fun! Well was going good till now. Have no idea what they want with ABC clue?? I am sure it has something to do with Pink flowers on wall but ??? ?